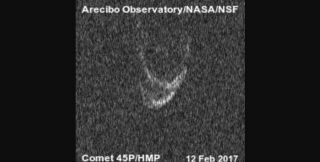 A series of delay-Doppler images of Comet 45P/HMP taken over 2 hours of observation. A rare opportunity to study a comet using radar technology has yielded new measurements of this traveling space rock's size, shape, geology and rotation rate. Comets don't often come close enough to Earth for scientists to study them with radar, but Comet 45P/Honda-Mrkos-Pajdusakovais making a rare close pass by the planet. It is now the seventh comet ever to be studied with radar, according to a statement from the Universities Space Research Association (USRA). The observations of the comet also show complex structures that scientists are still investigating. "Comets are remnants of the planet-forming process and are part of a group of objects made of water ice and rocky material that formed beyond Neptune," Ellen Howell, leader of the observing campaign at Arecibo, said in the statement. "Studying these objects gives us an idea of how the outer reaches of our solar system formed and evolved over time," added Howell, who is with the University of Arizona's Lunar and Planetary Laboratory. The lab did the observations in conjunction with the USRA. The radar observations give detailed information about a comet, such as its size, shape, geology and rotation. They also let scientists better predict where the comet will move in the future, as it allows for precise definitions of the orbit. Furthermore, radar can probe through the dusty environment surrounding a comet to see its nucleus. The comet's closest approach is roughly 32 Earth-moon distances from Earth (about 7.6 million miles, or 12 million kilometers), USRA representatives said in the same statement. The comet has an orbital period of only 5.3 years, but passes by Earth only rarely because the comet's orbit is influenced by the giant planet Jupiter. "As comets orbit the sun, the ices sublime from solids to gases and escape the nucleus," USRA representatives added. "The nucleus gradually shrinks and will disappear completely within in less than a million years."